Quick… tell me what comes to mind when you think of the word, “Angel.” For most of us, the image is one of a beautiful, winged creature, dressed in white, that floats effortlessly in the sky like those who once appeared in Bethlehem to welcome the Savior’s birth. Though most of us have never seen one, still most of us believe in their reality. The Scriptures certainly mention them enough to get noticed. Angels are mentioned over 200 times in the pages of the Bible. There are even passages that give a nod to our notion of guardian angels. Jesus said in Matthew 18:10 when speaking of children, “See that you do not despise one of these little ones, for I say to you that their angels in heaven continually see the face of My Father who is in heaven.” Notice the pronoun… “their,” as in the ones that are assigned to each child. Let’s flip the coin. Tell me what comes to mind when you think of the word, “demon.” Maybe you think of little devils with pointed tails and pitchforks. I have to admit that when I was growing up, we didn’t talk a lot about demons. Maybe we were too scared to even bring up the topic. Most of us used the “Exorcist” movie as a frame of reference when thinking about someone who was demon-possessed. The mention of demons in the Bible is much less prevalent than that of angels. In fact, demon-possession is only mentioned in the three Synoptic Gospel accounts. There is no mention of demon-possession in the Old Testament, nor in John’s Gospel, nor in the writings of Paul. Of course, the Book of Revelation has a lot of imagery concerning demonic forces. And certainly, throughout the pages of Scriptures there is a very clear description of the force of evil upon the earth. Paul reminds us that… “Our struggle is not against flesh and blood, but against the rulers, against the powers, against the world forces of this darkness, against the spiritual forces of wickedness in the heavenly places” (Eph. 6:2). Jesus faced such evil in the wilderness, in the garden, and even in the words of His disciple Peter (Matthew 16:23). Maybe it’s time to reframe both the imagery and definitions of angels and demons. The word, “angel” actually is drawn from the Greek word, “angelos.” It literally means, “messenger.” Heavenly beings were referred to as angels because they always acted on behalf of God, bringing His “message” to the people who needed to hear it. Pair that with this verse, “We are Christ’s ambassadors; God is making his appeal through us. We speak for Christ…” (2 Cor. 5:20 NLT). Here’s the point. Whenever we, as the people of God, act on God’s behalf, speaking hope, comfort, redemption, and grace, have we not become as His angels? Whenever we bring healing to that which is broken, whenever we affirm the value and worth of every person, whenever we demonstrate agape love and not divisive hatred, are we not numbered among the angels (messengers) of God? Let’s define demonic as anything that destroys or refuses to affirm, the Image of God in every person. Demonic elements could refer to anything that is, dehumanizing and contrary to the work of God. When defined in such a context, it is easy to see that the demonic work of evil is very prevalent in our world. There are many forces that seek the dehumanization of people. Let’s take a look at several. Think in terms of human trafficking. There are more people enslaved around the world today than at any other time in human history. Estimates range as high as 20-30 million world-wide. Human trafficking is the 3rd largest international crime industry in the world behind illegal drugs and arms trafficking. It reportedly generates $32 billion dollars in revenue each year. Those trafficked are not viewed as individuals made in the image of God, but as commodities to be bought or sold. Human trafficking is dehumanizing and contrary to the work of God. It is demonic. What about the subject of capital punishment? Shane Claiborne, writer and human rights crusader, writes extensively about the ethical dilemma of “killing to show that killing is wrong.” (His recent book, Executing Grace is all about this topic.) He is quick to point out that 85% of all death row executions happen in The Bible Belt. He adds, “We don’t always execute the worst of the worst, but the poorest of the poor, who haven’t the means for adequate representation.” (Spoken at Q Conference – Nashville 2017) I like his take on Jesus’ position on the death penalty when speaking about the woman caught in adultery who was about to be stoned to death… “The only One with the right to throw a stone has no desire to do it.” I certainly understand that there is anger and well-articulated arguments on either side of this issue. (I have a friend who is in his mid-20’s and who is on death row in Mississippi.) But I have to ask, “Is it right to repay evil for evil?” Does our practice of the use of capital punishment demonstrate that we have become a more “Christian Nation?” Is it our place to enact revenge? Have we dehumanized those on death row? Maybe the strongest indication of the evil around us can be found in the evil within us. Look at what social media has done to us. We spew out vitriolic venom at anyone who dares to disagree with our opinions and biases. Facebook has become Disgracebook. Twitter doesn’t just inform others and allow us to tell our stories, it gives us an immediate audience to which we can voice our rants. And what of the 24-hour news cycles that populate our television channels and fill-up our internet news feeds? Do they draw us together in common cause against the ills of our society, or do they divide us even further? 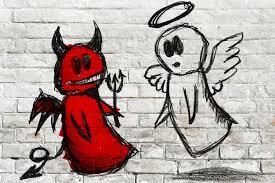 Angels and demons… which Kingdom do you represent?